The web is the backbone of so much of what we do, the pipeline, but how we access it changes so quickly. The various services that make use of this pipeline offer us a myriad of choices to ‘plug in’, and it can be hard to find the right balance that enables us to partake, yet not be inundated. 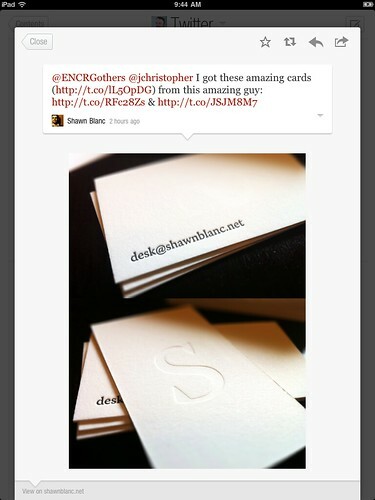 Shawn Blanc recently posted an article comparing RSS and Twitter that resonated with me. Through a series of good points, he illustrates how the newer service may have changed the way we use RSS, but it has not supplanted the former in its entirety. … people are subscribed to websites in RSS and following the author on Twitter. My usage fits with his conclusion, but it's finding the right balance that has been a struggle for me. The people I follow on Twitter are intelligent, dynamic individuals who all share items of interest to them. This increases my intake. This subject always reminds me of another piece that Shawn wrote last year. In this article, he speculated the need for a universally accessible (i.e. web based) service that could be used to collect the various bits of information of interest to us, that we see from various sources while on various devices. Almost a year later, I still feel that need. One fact that I do my best to keep in mind is this: there are two very different ways to use Twitter. Option A is as a social tool to interact and joke around with others, to connect. Option B is to use it as a source of sharing information, usually in the form of links to content or pithy blurbs of opinion. The first aspect is easy to manage; you reply to — or message with — the people who interest you, those you follow, or those who follow you. But it's that second part, Twitter as a source of information, that has become difficult to manage. Not on its own, but when combined with RSS feeds and when accessed from different devices, different actions are required. And sadly, these different actions are not always possible, especially from an iOS device. In the space of 10 tweets, I see three sources of information I would like to take action on. So, what do I do? I technically can look at them all on my iPhone, but that is less than ideal. The screen won't let me see that new design in its glory, I want to view the app in the MAS, and it's almost my turn in line so I can't read the blog post right now. Since Instapaper is basically a long list of items which can be added to from so many other apps, it would seem to be a great interim solution. But there are problems and it certainly wasn't designed with this purpose in mind. So I'm still looking for a better way to manage my intake. If one can understand the problem I outline here — and let's be honest, this is a trivial, first world type of problem, but it's one that I face daily and so spend time thinking on — then you can understand the temptation to simply create another bucket to process when at your primary computer. See stuff that interests you when reading RSS or Twitter, whether on your Mac or an iOS device, then process and organize, or act on, later at your Mac. The problem: your Mac is where you do your work. Even if your work is writing about all these types of things full time, you still have to turn off the stream and do some creating of your own. And for the rest of us, as useful as these sources of information are, they are also simultaneously a distraction that inhibit us from creating ourselves. Or worse, they take our attention away from more important things like our friends and family. But I haven't spent 700 words only to complain about the problem. I'd also like to share how I feel I'm getting closer to the right balance. Two things are always under scrutiny for me: my habits in these areas and the tools I employ. I do believe there is the right mixture that will allow me to still partake, but also create. My intention is not to be aloof, condescending, or out of touch. My intention is to try this on for a while and see if it improves the value and quality for all involved. Most of all, it allows me to turn my focus to what I feel is my mission here on this rock, writing and curating. Why? Because as satisfying as the intake can be (or the socializing), it's no where near the level of satisfaction of putting your everything into something you create. Patrick wants to get some writing done! And for me, batch processing is very attractive. Whether it's emails, or Twitter, RSS, or administrative tasks like invoicing and accounting, rather than doing here and there, I'd rather have a weekly routine that includes one chunk of time to get them done. Just one. As for the tools, two additions to my tool belt have helped tremendously. 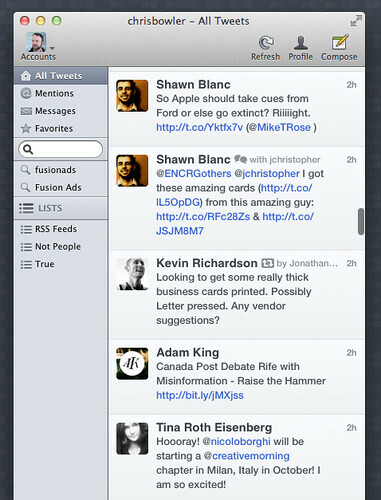 One is brand new, a Twitter client that only lets you post tweets. It's called Wren and I love the idea. At first I didn't. But only a couple days of usage have changed my opinion. The app was created with a purpose: to help you focus on your work without distraction, while still being able to share thoughts, resources, or funny tidbits on Twitter. I'd say the app is a smashing success (for me anyways) in two ways. One, it definitely reduces distraction. Secondly, it also increases your tweet quality. That's another area I've been thinking on and another aspect Patrick alluded to in the quote above. I do like to use Twitter for the social aspects, but I'd also like to be a better contributor, sharing resources that inspire me or have been very useful. Wren has helped in that way, primarily because I'm not reacting to what's in my timeline, I'm merely creating tweets of my own. 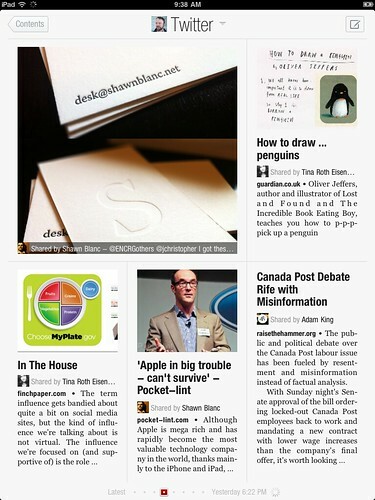 The second tool I've really come to appreciate is Flipboard. It's an iPad app, one I've had installed for months, but have not used at all until recently. After looking at it again, with only my Google Reader and Twitter account piped in, I've been blown away. The app allows me to do two things: comfortably consume on a device that is not my Mac, and it allows me to see the content shared in my Twitter timeline in a better light. In Flipboard, the content stands out in a way that allows me to better judge whether it is of interest to me. Even further, once I tap on a piece of content, the application nicely displays the tweet it originates from, including any commentary from the tweeter, while nicely displaying the linked page below. Swipe up and the content fills the page and the referring tweet disappears. Some objects come with more ambiguous habit fields … Let’s go back to your office desk. Say for example, every time you sat down in front of it, instead of doing your work, you checked e-mail, clicked on Twitter links and played Facebook games. Even if you have the most powerful processor, work-ready desk, and posture-supporting task chair, these items will absorb your behaviors and over time, their habit fields will shift in an unproductive direction. But with the arrival of the iPad, we had a new, more intimate way to consume some of our intake. With my iPad, my natural inclination has been to use it for consumption, not creation (yes, creation is possible, but it's still so much more work that I simply wait until I'm at my Macbook). And so I've been attempting to allow my natural tendencies to build specific habit fields around my two devices so that certain activities take place on only one and not the other. 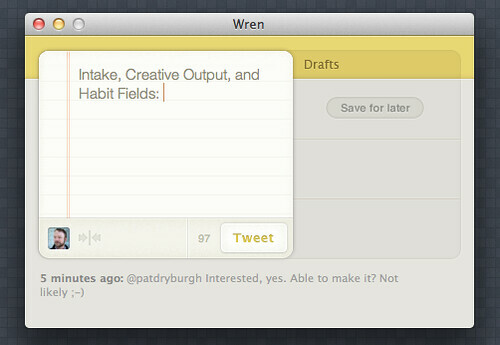 With Wren and Flipboard in my tool belt, this has become an easier, more natural fit. When I'm working, I can focus more on my tasks and when inspiration strikes, tweet (share) something without getting distracted by more links, @replies and DMs. Then at some point in the day, I take my iPad and open up Flipboard. There I can consume the various inbound content that is of interest to me. The problem I started this piece of with, the lack of a web based syncing tool, is still not solved. I currently send a lot of items to Instapaper and use various folders to triage (to post, to archive, to process) where applicable. It's not ideal, but I realize it's just another habit I need to create. Another bucket that needs to be processed. But overall, regarding the big picture of balancing input with creating quality output, I'm getting closer to where I want to be.